Satin Chrome Superquad w/22" Straight Arms. Arms are independently adjustable every 3" from 48" to 72". Includes adjustable levelers. 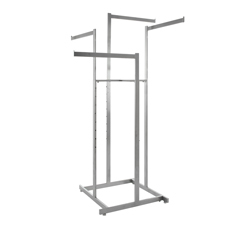 Entire rack is made of rectangular tubing with arms measuring 1/2"X1-1/2".